Wearable electronic devices are the future, and they’re already being developed and manufactured. To make the batteries thin and light enough to fit into these small devices, engineers have had to come up with some novel solutions. 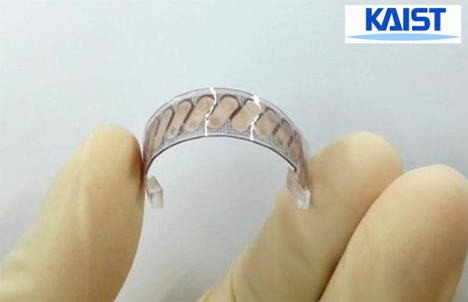 A team of researchers at the Korea Advanced Institute of Science and Technology (KAIST) have invented a lightweight wearable generator that uses your body heat to provide low-power devices with electricity. The flexible generator features thermoelectric materials embedded in a lightweight glass fabric. The result is a wearable generator that is hardly noticeable when it’s on, moves with your body, and generates a reasonably high power output. All it needs is the waste heat your body produces all day, every day. A 4″ X 4″ wristband made of the material would weigh less than half an ounce and produce 40 mW of power at room temperature. 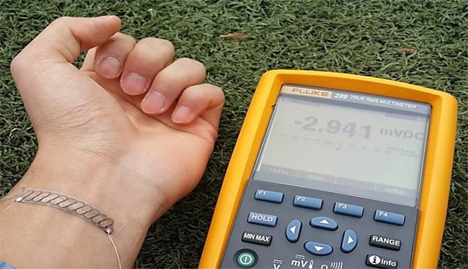 That’s not enough to power a consumer device like a phone or tablet, but it should be more than adequate for lower-power devices like fitness trackers and smartwatches. The researchers also believe that the technology could be used in a number of other industries where large amounts of waste heat are produced. See more in Energy & Power or under Science. April, 2014.